TRIVIA of Noh : Q141 : Are there two spaces on the Noh stage? | Home | Trivia | Q141 : Are there two spaces on the Noh stage? Are there two spaces on the Noh stage? In Noh plays, actors are not the only people who appear on stage. It is one of the characteristics of Noh plays that jiutai (singers) and hayashi (musicians), as well as kōken (assistants; See Trivia 51 and 91) appear together with shite and waki (leading and supporting actors). While musicians are hidden in the orchestra pit in opera, or behind the kuromisu (black bamboo screen) in Kabuki plays, the audience can see both the singers and musicians clearly in Noh plays. Jiutai and hayashi do not take part in the acting itself. Jiutai sit on stage left (jiutai-za) and hayashi sit upstage (atoza; also known as yokoza because the floorboards on the stage are laid crossways, or yoko) with the kōken, and play the music. 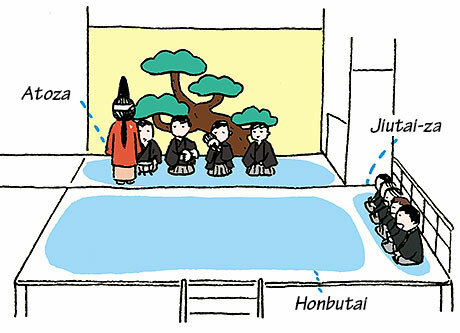 The audience sees a single continuous stage, but it is actually divided into the jiutai-za and atoza areas for singers and musicians, and the main stage for the acting. “Kutsurogi” is a unique stage direction that utilizes this stage structure. In this stage direction, the actors move into the jiutai-za or atoza and show their backs to the audience, temporarily exiting the ongoing scene. Knowing about such conventions will help you to understand the story.